An Australian Drop Bear. Although it looks remarkably like a koala it is only distantly related. This male is holding the remains of a ring-tailed possum in its elongated hind claws. In the rainforest remnants along the east coast of Australia live one of the most feared marsupials alive today. Drop bears, Thylarctos plummetus, have been responsible for the loss of livestock, pets and in at least two well documented cases, young children. They are ferocious, determined killers. At first sight a drop bear looks remarkably like a koala, but they are in fact more closely related to the now extinct Tasmanian Tiger, and the Tasmanian Devil. Carnivorous marsupials are not new. But unlike the Tasmanian Tiger (thyalicine) that died out in the 1930s, and the Tasmanina Devil which is experiencing a population crash because of infectious facial tumours, drop bear numbers have soared since European colonisation, chiefly because of the introduction of feral pigs. Drop bears are distinguished from koalas by several traits. The first is their size. They are at least two to three times larger than the average koala. A full sized drop bear will reach to a man's thigh. The second most obvious differentiation is that drop bears have two large canine teeth with which they rip their prey. Drop bears also have a reddish-orangy hue to their fur, and much larger hind claws than koalas. Interestingly, Drop Bears are only very distantly related to koalas. They evolved to look much the same, perhaps because they spend long periods of time - sometimes months - waiting in eucalyptus trees for suitable prey to walk past. Drop bears are always born twins, about the size of a thumbnail. The twin babies find their mother's pouch, and latch onto a teat each for the next 10 -12 months. During this time, one twin will kill the other, leading to the common belied that only one Joey is born at a time. Once the joey is furred with his eyes open, he will often climb on to his mother's back. Shortly after his second year, when their fangs are fully developed, the mother will encourage the young drop bear to find his own trees. There have been documented cases of mothers eating their own young. Drop bears live for at least 35 years. Drop bears usually hunt alone, but if a larger animal is caught, several drop bears will work cooperatively together to kill and eat it. 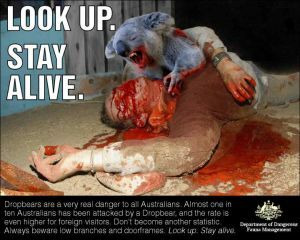 Drop bears are usually diurnal, but have been known to attack any time of the day or night. They can wait in a tree for literally months, sitting still in a semi comatose state, waiting for suitable prey to walk by. Once they have a kill, they will let the meat rot for a few days before devouring it. A single possum is enough to keep a drop bear alive for a week. Drop nears never drink water, getting what moisture they need from chewing leaves and drinking blood. Unlike koalas, which make a barking sound at night, Drop bears are completely silent, at least to the human ear. When attacking they let out an ultrasonic scream that is so loud it can completely daze any animal that can hear in that range. That is why their attacks against dogs and cats are so effective. Recent research has shown that a drop bear's fangs contain venom, much like a snake's. The venom is thought to contain toxic enzymes which break down fresh meat, causing it to rot faster. Drop bears never eat fresh meat, they always let it putrefy first. Their mode of attack is as simple as it is deadly. When a suitable prey is directly under the branch they have been waiting on, they will literally drop on the animal, from a height of up to eight metres, and set about ripping its head off. They will then take the carcase, or bits of it, back up in to the tree, where they will hold on to it for several days until the meat has rotted a bit, before eating it. Once shot for their fur and teeth (said to be the best ivory in the world) drop bears have been a protected species since 1968. Since that time, their numbers have climbed dramatically. so much so that in some National Parks a permit is required before you can enter them. To obtain a permit, a bushwalker has to undertake a two-day drop bear safety course. Protecting oneself against drop bears is relatively easy. Naturally, walking under trees in a drop bear infested area is not a good idea, but because the Australian bush is sometimes so dense, it becomes unavoidable. Drop bears will not drop if they think you are looking at them. A simple pair of glasses with eyes painted on them, placed over a hat so they are looking directly up, is usually sufficient to ward off most drop bear attacks. Another effective trick is smearing one's skin with Vegemite, a concentrated yeast extract which Australians love to put on their sandwiches. For some reason drop bears - and many Australian insects for that matter - hate the smell, and will go to great lengths to avoid it. Many overseas visitors prefer using this method, because as Vegemite is a deep dark brown that stains readily, it means they get an instant artificial tan.